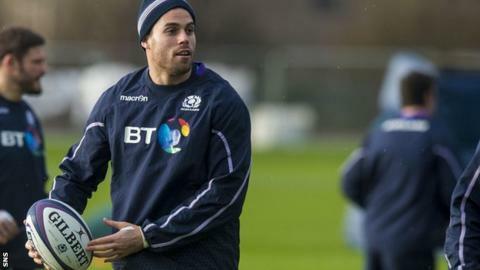 Wing Sean Maitland believes Scotland must cast aside the historical baggage of Saturday's Calcutta Cup clash and focus on a game-plan to beat England. The New Zealand-born back joked his "grandparents made it pretty clear that I had to hate the English" before he made his debut at Twickenham in 2013. Captain Greig Laidlaw said they were "almost paralysed by emotion" in a dismal 20-0 home defeat the year after. "Maybe in the past the emotion has probably been too much," Maitland said. "We haven't just focused on our skill-set and how we wanted to play - and had a chip on our shoulder. "Now we are just focusing on us; we are not worrying about results and what happened in the past. We are just working on how we are going to beat England. "It is a massive Test match, it has been sold out for months and the atmosphere is going to be unbelievable. But, at the end of the day, it is just a rugby game. "I have been playing rugby since the age of five and my mind-set is always 'It is just another rugby game. What can I bring? How am I going to help this team win and achieve something special?'" Maitland, 27, marked his Test debut at Twickenham with a try - one of only 11 Scotland have scored in 16 meetings with England in the Six Nations, with only two of those 11 coming at Murrayfield. However, the match ended in a comprehensive 38-18 defeat for Scotland, one of six in a row against England since a 15-15 draw in 2010. Of Maitland's 20 caps to date, only six have come in the Six Nations, with injury preventing his participation since the first game of the 2014 tournament. He admits the timing of a recent hamstring problem was "a concern" coming into this year's Championship, but having come through 80 minutes for London Irish against Sale on Saturday, Maitland has declared himself "fit and healthy and fresh". Maitland's daily commute to training with his new club is a constant reminder of Scotland's agonising World Cup quarter-final defeat by Australia. "Living in London, I have to drive past Twickenham every morning and it reminds me of that day," he said. "It was tough, but we have to take the positives out of it. We were one refereeing decision away from the semi-final, so we have to try to build on that. "It is the same group and, in the last two days, you can see there is way more confidence and a desire to get better. "We let ourselves down in the Six Nations last year, coming last, so there are definitely a lot of points to prove this year. "There are no excuses now. I know there are people outside the environment who expect things from this Scotland team, especially after the World Cup. "We have to take our opportunities and grind out games if necessary, which we did at the World Cup. "We have the same group, nothing has changed, we know our structures and we know how [head coach] Vern [Cotter] wants us to play the game. "With [backs coach] Jason O'Halloran coming in as well, who has a lot of knowledge, we have to keep moving forward."